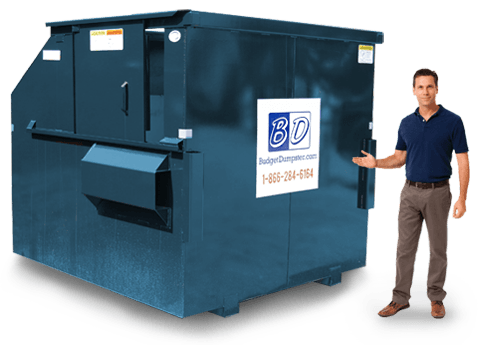 Get a great commercial dumpster from us, just like you would one of our roll-off rentals. 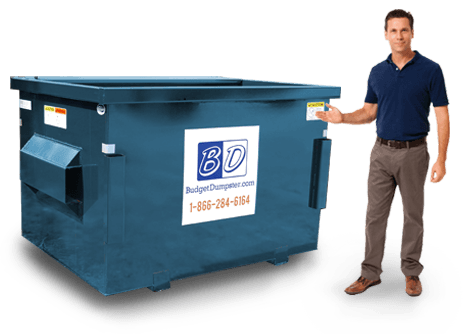 We have front-load and rear-load dumpsters that you can receive from us. Each one comes with a one year contract that includes weekly waste removal. It's easier than ever before to get scheduled trash pickup and stay under budget. We don't nickel and dime you; our goal is to forge lasting relationships with all of our customers because we're in it for the long haul. 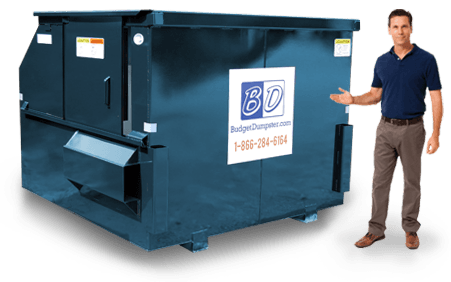 If you're unhappy with your current dumpster situation, why not come over to Budget Dumpster and see what the other side is like. Get a quote today! 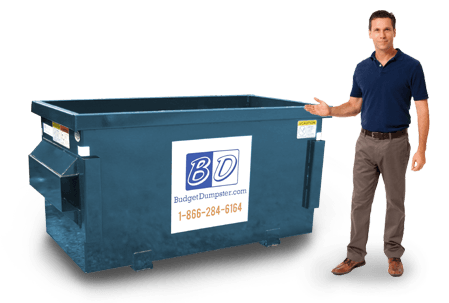 We aren't like those other guys, at Budget Dumpster, we don't do fly-by-night dumpster sales. This is the case for both our rental service and our commercial service in the Boston area. We care about the city, and we care about the environment just as much. We want to be the most sustainable waste removal company in the business. Every day, we are working to find better alternatives to what happens to your refuse. We recycle whenever possible, and the rest we handle with as much care as possible. The way we treat our customers is the way we treat the environment, so you've got nothing to worry about on that front. Holds 800 - 1000 lbs. of waste. Our 2-yard dumpster is the baby of the bunch, but don't be fooled. Just because it's our smallest choice, don't think it can't hold the waste. If you are a smaller office building or restaurant, this is going to fit you just right. And it doesn't take up a lot of space either, so you don't have to worry about that. It's about 3 feet high and perfect for businesses that are about 2,500 square feet. We can fit them almost anywhere. The 4-yard dumpster is the medium-sized option. This one has twice the capacity of the two yard container, and it still works for those that might not have the space for a gargantuan dumpster onsite. Especially if you're right in the city, this could be the best choice for those that have some waste, but need to be space-conscious as well. It's only 6 feet wide, with a length of 4 feet and about 4 1/2 feet tall. It's that great middle ground for smaller retailers or local grocery stores. Our 6-yard dumpster is the best of both worlds. It's a little on the larger side, but it's got a sliding door for easy access. This one is a good fit for hotels, strip malls, larger retailers, that sort of thing. Its dimensions are: 6 feet wide, 5 feet long, and about 6 feet tall. You're working with the big dogs, but without the bite. Don't think this commercial dumpster is pulling any of its punches though. Make sure you know what you're getting into! The 8-yard dumpster goes out to all the warehouses out there. This one is great for any office parks and apartment complexes in Boston. It's 7 feet tall and it's got a sliding door. It's easy to load up, but it doesn't mess around. You're going to be able to load a lot of waste inside this thing. But proceed with caution; you might need a map to find your way out of this guy.